I modified the recipe slightly to my taste. For the steak and kale you can follow this link. For the mushroom gravy, here’s my own recipe which is slightly spicy (the way I like it). Heat olive oil in a non-stick pan on low-medium heat. When warm, add the garlic and dried chiles and saute for a few seconds. Add the onions, saute for a minute and then add mushrooms turning the heat to high. Meanwhile, mix the cornflour and milk and keep ready. Once the mushrooms start shrivelling and leaving water, turn the heat to medium again and add the cornflour mix and chicken stock. Once the mix starts to thicken, add the red wine vinegar, salt, pepper ( I put a lot of pepper) and coriander. Stir well for 2 minutes, turn off the heat and let it stand for a couple of minutes before serving. 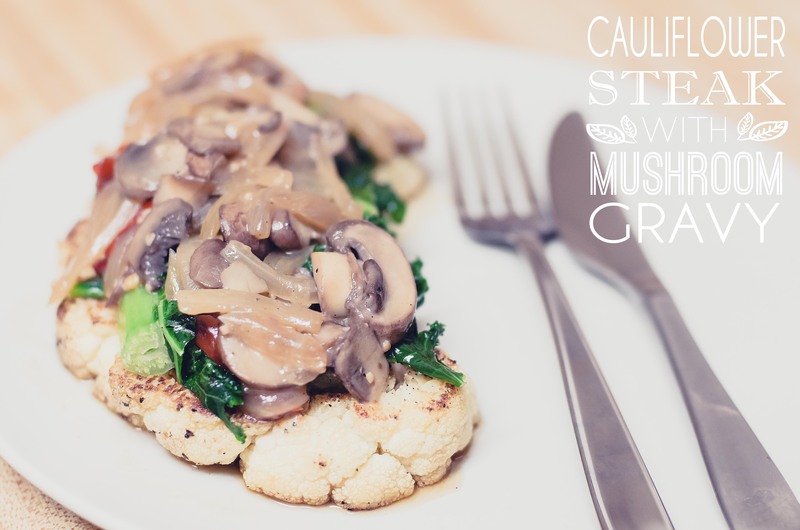 This entry was posted in FOOD, Recipes and tagged cauliflower, healthy, kale, Mushroom, mushroom gravy, nutritious, RECIPE, vegetarian. Bookmark the permalink. Wow, thank you so much for the lovely comments and for trying out this recipe. Your take on it looks super!